who knows how to handle the hurdles and get past the barriers to successfully book the tickets (tatkal). It may seem a little overrated but tatkal booking has become an art. Yes, an art and only few understand it. You may have heard of people using scripts, softwares and all. To suppress the activities of such people/agents IRCTC is trying hard by introducing new and new rules. Along all the circumstances if you are going to book a tatkal ticket for yourself you can do it easily. All you need to do is follow these simple tips. 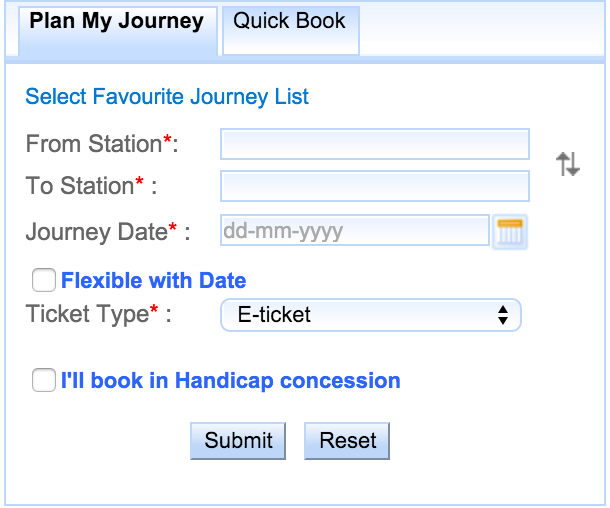 So, the trick is to use Quick Book form to book your tatkal tickets. Let me show you how it is fast and way ahead than others users booking at the same instance of time. The thing you are going to do is to login just 5 minutes before tatkal time and keep refreshing till less than 2 minutes are left. Then fill your Quick book form. In order to fill the quick book form you must know the correct train number and and station codes. Now fill your form. Example image given below. Here is what I do mostly to get my tatkal tickets booked. First, I login 5 minutes before the tatkal time. So for AC tickets I will login at 9.55 a.m and for Non-AC tickets I will login at 10.55 a.m. After login I will refresh the page till 9.58 or 10.58 as per the requirement. When 2 minutes are left to book the tatkal tickets I will enter my journey details in Plan my Journey. Then I will click submit. Then I will select the quota tatkal. After that I will click on the desired class in row of the particular train in which I want the ticket. This image is for illustration purpose and does exactly match with the trick image. Combine Updated Method from here: You need not to refresh just let your PC clock struck 10.00 am and hit the Book now button. At this time when others will be refreshing the page you will get into the passenger’s details page. Use Magic Autofill method to enter your passenger details automatically. Enter CAPTCHA and fill the payment details as fast as you can. I recommend you use SBI internet banking for that. This will surely help you to get your tatkal ticket booked. If you have any questions please do ask me in comments I will try to help you as soon as possible. Sir, I tried this trick but when i click on my desire class at 10.59, there was a HASHTAG # there and no BOOK NOW button on site. BOOK NOW came after refresh @ 11.00 AM. Pl clear this stage. I think there is some problem at this stage some users are getting the book now button (as far as i know) and some users don't. I will check it and update the method as soon as possible. Thank you for your comment! Yes must submit Plan my journey only after 10:00 or 11:00,then only Book will appear for tatkal.I used to book takal following same method. Tatkal ticket booking starts at 10 am and 11 am! Hi manoj, please check the updated method above in the article. Hi, Biju please check the updated method I have given. This will surely help you! Bahut sahi tareeka hai tatkal book karne ka. Dhanyawaad btane k liye. Thank you very much. This helped me. With Quick Book and Magic autofill it makes easy to book the tatkal ticket. Really awesome! Updated method k baad bahut aasaan tareeka ho gya. Quick book pe toh mera dhyaan kabhi gya he nai tha! Ji bahut logon ko aasaani hui hai isse. Bahut achchi baat h ki aapko isse fayda hua. Agar apko koi aur bhi jaankari chaiye toh bila jhijhak pooch sakte hain! That is right. Thank you for visiting my site! Keep visiting! QUICK BOOK OPTION 12 THAK BAND REHTA HE..
kya apko pakka pata hai ki quick book option 12 bje tak band rehta hai? mjhe tatkal tiket book karna hai.. kya aap meri madad karenge? Sir, From where I will get the Magic auto fill ? Quick book feature does not work during tatkal hours. "Quick book service is not allowed between 08:00 AM – 12:00 PM"
prabhu JI…QUICK BOOK OPTION 12 THAK BAND REHTA HE.. HE IS RIGHT.